For other uses, see Diadem (disambiguation). Coin of Antiochus III the Great of the Seleucid Empire, shown wearing a diadem; the Greek inscription reads ΒΑΣΙΛΕΩΣ ΑΝΤΙΟΧΟΥ, of King Antiochus. A diadem is a type of crown, specifically an ornamental headband worn by monarchs and others as a badge of royalty. The word derives from the Greek διάδημα diádēma, "band" or "fillet", from διαδέω diadéō, "I bind round", or "I fasten". The term originally referred to the embroidered white silk ribbon, ending in a knot and two fringed strips often draped over the shoulders, that surrounded the head of the king to denote his authority. Such ribbons were also used to crown victorious athletes in important sports games in antiquity. It was later applied to a metal crown, generally in a circular or "fillet" shape. For example, the crown worn by Queen Juliana of the Netherlands was a diadem, as was that of a baron later (in some countries surmounted by three globes). The ancient Celts were believed to have used a thin, semioval gold plate called a mind (Old Irish) as a diadem. Some of the earliest examples of these types of crowns can be found in ancient Egypt, from the simple fabric type to the more elaborate metallic type, and in the Aegean world. A diadem is also a jewelled ornament in the shape of a half crown, worn by women and placed over the forehead (in this sense, also called tiara). In some societies, it may be a wreath worn around the head. The ancient Persians wore a high and erect royal tiara encircled with a diadem. Hera, queen of the Greek gods, wore a golden crown called the diadem. 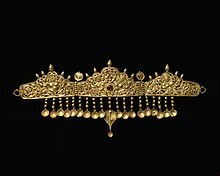 The Priest king of the Indus Valley Civilization wore what is probably the oldest example of a Diadem approx. 3000BC. By extension, "diadem" can be used generally for an emblem of regal power or dignity. The head regalia worn by Roman Emperors, from the time of Diocletian onwards, is described as a diadem in the original sources. It was this object that the Foederatus general Odoacer returned to Emperor Zeno (the Emperor of the Eastern Roman Empire) after his expulsion of the usurper Romulus Augustus from Rome in 476 AD. The diadem or crown of Princess Sit-Hathor Yunet from her tomb. 12th Dynasty Egypt 19th century BC. The centerpiece of this Hellenistic diadem is a Herakles knot, known for its apotropaic powers and its status as a symbol of fertility. Walters Art Museum, c. 3rd – 2nd century BC. ^ William Dwight Whitney, The Century dictionary; an encyclopedic lexicon of the English language. New York: The Century co. (1889), page 3,772. Google Book Search. Wikimedia Commons has media related to Diadems. Diadem. Livius. Articles on Ancient History.